Dear Frida: I admire your fortitude, your originality and personal oeuvre that identified with Mexico, your beloved homeland. We recognize you in dozens of self-portraits with your bold unibrow and mustache, the flower crown in your hair and the native costumes you preferred wearing as a symbol of your Mexican heritage. As an iconoclastic artist you painstakingly rendered striking, often shocking images that often reflect your own pain and turbulent life. Yours was a journey that began as a self-taught artist and evolved over time with kudos of the international recognition. No matter where she traveled, whether in Paris, New York or her native country Frida fashioned herself elaborately in the Tehuana costumes of Indian maidens, creating an identity that clearly was unique and captivating. She painted using vibrant colors in a style that was influenced by indigenous cultures of Mexico. Frida Kahlo (born Magdalena Carmen Frida Kahlo y Calderon, July 6, 1907-July 13, 1954) was one of four daughters born to a Hungarian-Jewish father and a mother of Spanish and Mexican Indian descent, in the Mexico City, suburb of Coyoacan. She was born amidst political chaos in her homeland and throughout her life Frida preferred to claim 1910 as the year of her birth which coincided with the outbreak of the Mexican Revolution (1910). Some say that Frida adopted the Tehuana form of costume to hide her legs. There may be some truth to it. A polio survivor at fifteen, Frida’s young life was dramatically altered due to a tragic accident. Frida had entered in the premedical program at the National Preparatory School in Mexico City, but that ended when she was gravely injured in a trolley car accident three years later when she was eighteen years old. Despite spending a year in bed and enduring more than 30 operations recovering from fractures of her back, collarbone, ribs and a shattered pelvis, shoulder and neck injuries. The injuries left her broken as a youth and debilitated throughout much of her adult life. She suffered a life of constant pain and often had to wear a body brace to support her weakened condition. One wonders what Frida could do to while away the dreary hours of recovery. 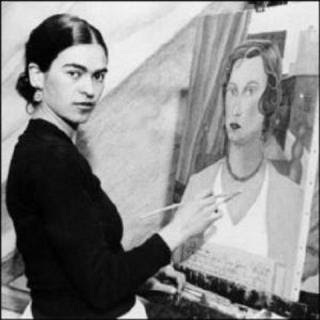 It was during this year of convalescence that Frida began to paint with oils. Her paintings were mostly still lifes and self portraits filled with the bright colors of Mexico’s native folk art. Her talent evolved dramatically with self-expression and her profound reactions to life that she produced in surrealistic style in her paintings. About a third of her body of work, about 55 paintings, consists of self portraits. 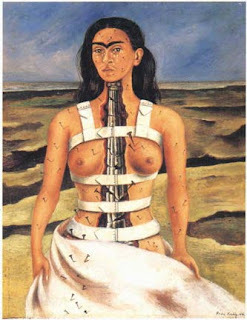 In some she stares out passively, in others Frida’s oeuvre was fantastic and sometimes gory depictions that symbolically articulated her own pain. Revealing different states of her mind are portrayals revealing her heartbreak, abortion and miscarriage. Yet there was a feeling of realism in many of her works which she rendered with real images in the most honest, straightforward way. High up on a scaffold, the celebrated muralist Diego Rivera sat contentedly high on his perch doing what he loved doing, painting grand public murals with political themes. She encountered the larger than life Diego in such a manner but had actually met him first as a schoolgirl. At 21, Frida fell in love with Rivera, whose approach to art and politics suited her own. Although he was 20 years he senior, they were married in 1929 and she became his third wife. The two became intertwined in a tumultuous marriage. Although as a couple, they remained childless one can observe Frida’s anguish of miscarriage in her painting. During most of their life together Frida was often immobilized in a cast in her bed, or confined to a hospital room awaiting an operation or recovering from a surgery. Her torment was abetted by Diego’s incorrigible philandering, once with Frida’s own young sister, Cristina. Yet, Frida remained loyal often referring to him as her "Baby. " Frida took great pride in keeping a home for Diego and loved fussing over him, cooking for him and even bathing him. Their love proved sustainable. The couple traveled to the United States and France, where Frida met luminaries from the worlds of art and politics, and had her first solo exhibition at the Julien Levy Gallery in New York City in 1938. Though they divorced in 1939 the two remained inseparable and remarried in 1940. 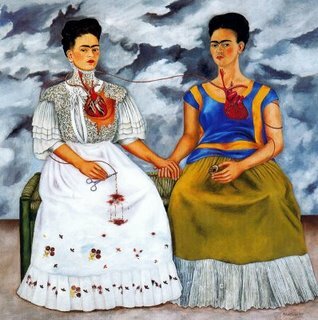 Frida’s painting “The Two Fridas,” a double self-portrait, painted in 1939 at the time of her divorce from Diego is believed to be an expression of Frida’s feelings at the time. She delighted in children and had many pets including the mischievous spider monkey that appears in “Self-Portrait with Monkey.” She loved visitors and often begged friends and “lovers to visit, not to “forget” her. Sadly after a lifetime of great fortitude and constant pain Frida Kahlo died at the age of 47. The legendary artist has of late been transformed into a veritable cult figure with numerous books and films depicting her life. At one time there was even a cult of young women who would affect the Frida Kahlo look, simulating Tehuana costumes, the flowered headdresses and long skirts of the artist. 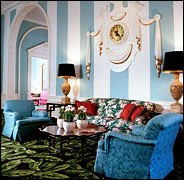 In a lovely tribute to Frida Kahlo this Deco Diva and her iconic works continue to attract admiring followers. Dear Claire: Paris can still claim its title as Haute Couture fashion capital of the world but American Sportswear, the concept of mix and match coordinated pieces is duly a credited to your creative innovation. 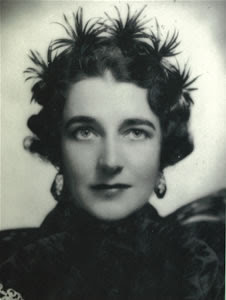 As a pre-eminent American ready-to-wear fashion designer in the 20th century you understood the new independent woman and her active lifestyle from living in suburbia and chauffeuring children to school and husbands to the train station to engaging in sports activities, the gym and cultural pursuits. McCardell was a woman of her time. She knew what women wanted and patterned many of her design ideas after her own wardrobe needs. McCardell gave new meaning to term ‘Casual Chic’. Stylish, functional, affordable and versatile the coordinated garment pieces produced the concept of “separates” that made dressing from day into night and weekends spontaneous and comfortable. Her easy-to-wear approach to fashion is synonymous with the term ‘leisurewear’ and produced a loyal following among women of the pre WWII era, who rejected the formality of the French Couture. Women owe you a debt of gratitude to McCardell’s design concepts for even today casual wear is a mainstay of the American woman’s wardrobe. McCardell freed women from wearing the structured undergarments such as corsets, crinolines and girdles underlying the corporeal restrictions and dictates from Paris in the 40s and 50s. In her book, “What Shall I Wear?,” (Simon & Schuster 1956) she wrote that McCardellisms were ‘A glossary of terms that speak to me of fashion…and haven’t very much to do with Webster.’ She referred to separates as Strip-Tease or Matches: Clothes in pieces. You can wear all of them at one time or only two or three pieces, but they all go together and are made of related fabrics. Cultivating the cult of soft, fabric draping and gathering to accentuate the natural shape of the body McCardell fashions had vast appeal, not only for their easy-wear facility but they were relatively inexpensive. These versatile separates and dresses were produced in materials borrowed from men’s wear, lingerie and even children’s wear incorporating natural-fiber fabrics such as cotton, twill, gingham, denim and jersey. 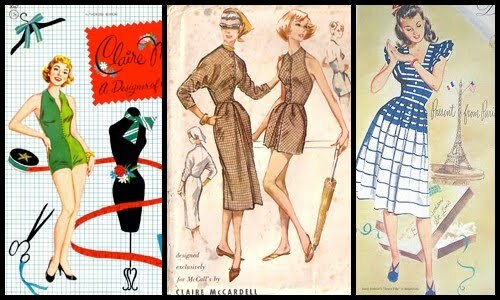 McCardell knew a woman’s need for pockets and pleats were plenty. She was the first with the “riveted look,” using work-clothes grippers for fasteners and ornamentation and snappers made it easy to snap jackets, blouses and pants on and off. When the advent of WWII brought shortages of leather McCardell put her models in fabric Capezio ballet slippers, often matching the fabric of the garment. The fad caught on and gave the ballet slipper new meaning as footwear. 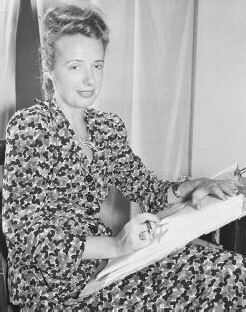 As a child, McCardell (1095-1958) lived in Frederick, Maryland, the daughter of Adrian and Eleanor McCardell and her early interest in fashion emerged serendipitously. Playful and creative she would cut figures from her mother’s fashion magazines and create paper dolls and fashion imaginary garments. It is not surprising that the spirited young girl began sewing her own clothes as a teenager. After first attending Hood College in Maryland she switched to Parsons in 1925 to pursue her interest in fashion and received her certificate in Costume Design. After years on Seventh Avenue as the recognized pioneer of American sportswear, she returned to Parsons in 1944 as a critic and instructor.